Tony received a Bachelor of Arts degree, with honors, from the University of Connecticut in 1977 and his Juris Doctorate from Chicago-Kent College of Law in 1981. He was admitted to the Tennessee Bar in 1982 (inactive) and Florida Bar in 1998. Prior to moving to Florida in 1998, Tony practiced as a partner with the law firm of Baker, Worthington, Crossley, Stansberry & Woolf and as a shareholder with the law firm of Baker, Donelson, Bearman, & Caldwell P.C. 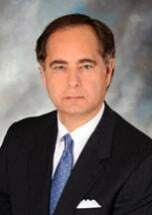 Tony has significant experience in defending medical malpractice, products liability, long‑term care and catastrophic loss claims, including class actions and mass tort litigation. Since 1987, Tony has been rated "AV" by the Martindale-Hubbell Law Directory. Tony focuses his practice on complex commercial and litigation matters as well as marital and family law, concentrating on complex dissolution of marriage actions, including tax and asset valuation issues. Tony is admitted to practice in all courts in the State of Florida.